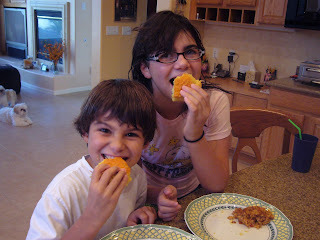 Cooking With The Kids: Barefoot Bloggers - Our Week! Weeee! It's our week to choose for Barefoot Bloggers! 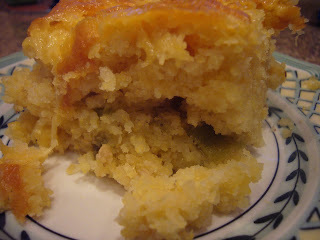 We were so excited to make this recipe - Jalapeño Cheddar Cornbread. It was so good, we made it twice - and the second time we decided that cornbread needs actual corn kernels in it. We also added roasted chile peppers instead of the jalapeños. 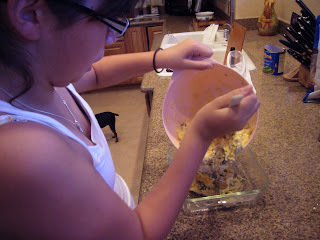 Our mom also taught us how to cut down a recipe, since this makes alot of cornbread. Alexander here - It was really good. But my chili that we had with it was even better. Sabrina here - It was a mouthful of chile pepper and corny goodness. Yum! What could be better than that? Next time I will make sure to not dump the chopped peppers all in one place. It's also really good the next day - we put it in the toaster oven until it was nice and crispy. Thanks again Tara, for letting us join and choose a recipe! 3 tablespoons seeded and minced fresh jalapeno peppersCombine the flour, cornmeal, sugar, baking powder, and salt in a large bowl. In a separate bowl, combine the milk, eggs, and butter. With a wooden spoon, stir the wet ingredients into the dry until most of the lumps are dissolved. Don't overmix! 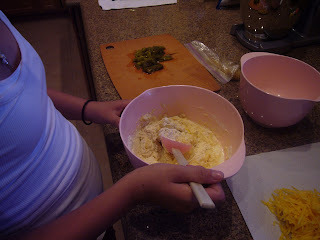 Mix in 2 cups of the grated Cheddar, the scallions and jalapenos, and allow the mixture to sit at room temperature for 20 minutes. Great choice and I like the idea of adding corn! Sounds tasty! Great choice you guys! We had chili with ours too! You guys rock! Thanks for the great pic. This was a great pick! I love jalapenos and I love cheese. Congrats on a job well done! ps, I your little doggies are adorable. Thanks for choosing this recipe. We liked it better than the recipe I usually use! Such a great choice and well enjoyed in my house! Great idea to add corn! This cornbread was really good! I'm glad you guys chose it. Thanks for picking a fun recipe to try! Yours turned out great--good idea to add the corn I never thought of that! Good choice. It gave me an opportunity to try something new. Thank you for a great recipe pick! It looks like yours came out very well. thanks for picking such a great recipe guys! !